the worldwide uniformity of measurement—remains as important today, in 2011, as it was in 1875. Both the International Organization of Legal Metrology and the International Bureau of Weights and Measures are deeply involved in the improvement of chemical measurements. For this reason, the two international metrology organizations have decided to join IYC2011 and have chemical measurements as the theme for this year’s World Metrology Day. Special posters have been designed, and events will take place all over the world. Judging from the success of previous years, it is expected that the 2011 World Metrology Day will again attract thousands of visitors to the website and a vast number of international celebrations across the planet. 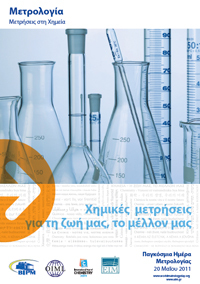 Visit the website and learn why metrology, the science of measurement, goes hand in hand with chemistry in 2011.